Welcome to the VR Austin Jam! Come get your hands on cutting-edge technology, collaborate with some of the biggest names in VR, and show off your creations at the after-party. 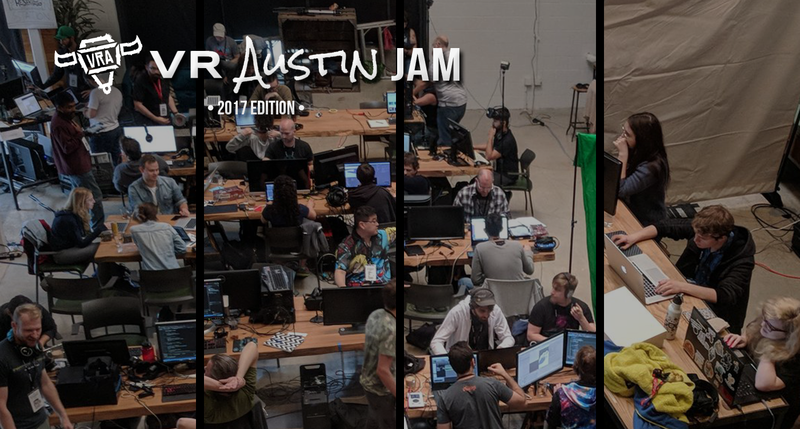 Building on the success of our annual jam, VR Austin is hosting the 2017 VR Austin Jam. Join our creative community of virtual reality developers in beautiful Austin, Texas for three days of hard work and hard partying! This year we were pleased to have over 85 jammers at the VR Austin Jam along with our incredible lineup of sponsors. We've opened this itch.io portal for jammers to upload their projects to share with the world. Consider this your one-stop shop for VR Austin Jam 2017 demos. VR Austin is a collective of the best and brightest virtual reality developers in Central Texas. We meet bi-monthly for demos, brews, networking, and sharing information in the VR space. If you're an aspiring VR developer, artist, programmer, designer, musician, games person, film person, or curious about VR, VR Austin has something to offer. Remember if you tweet about your jam submission to use the hashtag #VRAustinJam. We are happy to share submissions on our account for more visibility. Thanks for being a part of this year's jam! Grow your own veggies and send them to the market! You are a Catapult of course. Prototype for a puzzle-room two player experience. The Preservation Station preserves the stories of places that no longer exist. VR Input prototype for conventional top down controls.